Please contact us with any questions. 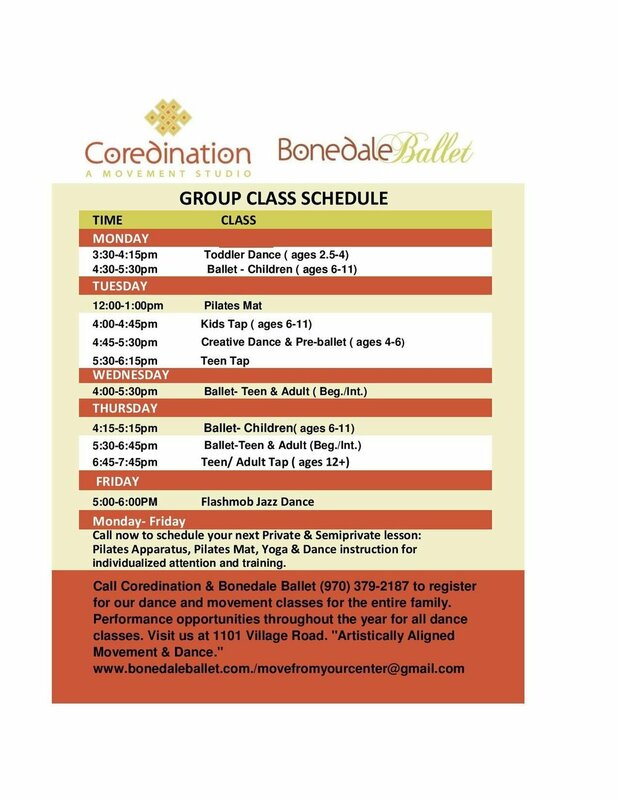 We would love to talk to you about the unique programs we offer at Coredination, including Bonedale Ballet! Keep up to date with our upcoming events and news! Class Schedule, New Classes, Ballet Tap & Flashmob Performances! Happy Spring, You have landed on the right page for updates on Coredination & Bonedale Ballet. See our updates below! Ross Montessori School Fundraiser- Friday, April 5 at the Aspen Glen Clubhouse in Carbondale, Co.
Dandelion Days- May 11 at Sopris Park in Carbondale, Co.
Carbondale Mountain Fair- July 26-28 at Sopris Park. Call Alexandra (970) 379-2187 to sign up now for your favorite dance & movement class. If you have an upcoming event or fundraiser in which you need entertainment, you can book your next Flashmob dance performance now! Save the Dates: Bonedale Ballet Dance Performances 2019! Dance Performance Photographs of Bonedale Ballet dancers. Website designed by WebEntity, a YouthEntity program.